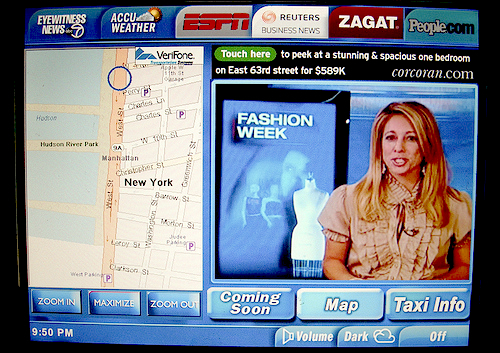 SF Taxi Media: Consulting Firm Is Researching 5% Credit Card Fees, Rear Seat PIMs, and Electronic Waybills For The MTA. By John Han. Consulting Firm Is Researching 5% Credit Card Fees, Rear Seat PIMs, and Electronic Waybills For The MTA. By John Han. The San Francisco Municipal Transportation Agency (SFMTA) has hired Nelson Nygaard, a transportation planning firm, to research 5% credit card fees, rear seat Passenger Information Terminals (PIMs), and electronic waybills. The consulting firm is conducting interviews on an invite only basis with persons from San Francisco's taxi industry, including representatives from Yellow, Luxor, De Soto, Green, Metro, National, Black and White Checker Cab, the Medallion Holders' Association, the San Francisco Cab Drivers' Association, the Burmese Cab Drivers' Association, Tariq Mehmood, and a handful of others. Interviews began on Tuesday, August 16th, 2011, and are scheduled to continue until Thursday, August 18th. Although the credit card fees, rear seat PIMs, and electronic waybills are being supported by a share of the industry's cab companies, the items were the main targets of four taxi protests staged by cab drivers between April and June of 2011. At least two of those protests were major in size, involving hundreds of cab drivers circling City Hall in their taxis and honking horns for hours. Another one of the protests also involved taxis circling City Hall and honking, but was smaller in size. In the past, the San Francisco Planning and Urban Research Association (SPUR) consulted with Nelson Nygaard in a report titled, "Making Taxi Service Work In San Francisco". That report was dated in 2001. It includes recommendations such as returning to a "split-meter" system, claiming that a split-meter would give cab companies direct financial incentive to improve service, carry more passengers, and expand markets. The 2001 report says that with direct financial incentive to service the public, cab companies would become true taxi providers again, rather than remaining simply as car rental companies that do not necessarily provide services to the public. CLICK HERE to view that report. As you may recall I've often advocated a split meter for the same reason as Nygaard and I mentioned it again when I met with their representative on Tuesday. This would not only motivate the companies to improve their service but also would automatically give the drivers all the protections of being an employee - along with all the drawbacks like being told where to go, who to pick up and when. Furthermore, it would require accurate knowledge of every pick up that a driver made, making the current argument about electronic waybills moot. You couldn't have a split meter without them or something like them. The the company argument against a split meter has always been that the drivers would high-flag. But with GPS technology and electronic tacking that would become a thing of the past. The companies could know where you are and what you are doing every moment you are on the job. 20 years ago, a few radicals and I signed up the majority of drivers for a petition asking the city for "employee rights." I wonder if I could do such a thing with the anti-electronic waybill crowd now? I guess the question is whether currents drivers prefer to anonymous and under the radar or do they want the rights of a worker? Single Operator taxis are the correct solution. Splitting meter would be disastrous. Single operator taxis would be disastrous. Splitting meters is the correct solution. Johnny walker sez, SINGLE OPERATORS, put an end to the corruption! Jack danials says Johnny Walker is pathetic, one of the easiest things to do is ridicule and then go run and hide behind anonymity. Get a life pathetic boy.